When passing the results of data cleansing activities back to source systems I have often encountered what one might call broken links, which have called for designing data flows that doesn’t go by book, doesn’t match the first picture of the real world and eventually prompts last minute alternate ways of doing things. I have had the same experience when passing some real (and not real) world bridges lately. When walking around in London a sign on the Albert Bridge caught my eye. The sign instructs troops to break steps when marching over. In researching the Albert Bridge on Wikipedia I learned that the bridge has an unsound construction that makes it vibrate not at least when a bunch of troops marches across in rhythm. The bridge has therefore got the nickname “The Trembling Lady”. It’s an old sign. The bridge is an old bridge. But it’s still standing. The same way we often have to deal with old systems running on unstable databases with unsound data models. That’s life. Though it’s not the way we want to see it, we most break the rhythm of else perfectly cleansed data as discussed in the post Storing a Single Version of the Truth. 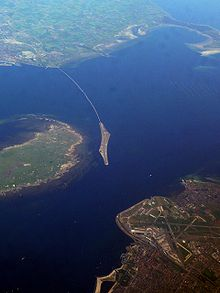 The sound between the city of Malmö in Sweden and København (Copenhagen) in Denmark can be crossed by the Øresund Bridge. If looking at a satellite picture you may conclude that the bridge isn’t finished. That’s because a part of the link is in fact an undersea tunnel as told in the post Geocoding from 100 Feet Under. Your first image about what can be done and what can’t be done isn’t always the way of the world. Dig into some more sources, find some more charts and you may find a way. However, life isn’t always easy. Sometimes charts and maps can be deceiving. Wodna: The Sound of Silence. As reported in the post Troubled Bridge over Water I planned a cycling trip last summer. The route would take us across the Polish river Świna by a bridge I found on Google Maps. When, after a hard day’s ride in the saddle, we reached the river, the bridge wasn’t there. We had to take a ferry across the river instead. I maybe should have known. The bridge on the map was named Wodna. That is Polish for (something with) water. Besides being a data geek I am also interested in pre-modern history. So it’s always nice when I’m able to combine data management and history. A recurring subject in historian circles is a suspicion saying that Explorer Marco Polo never actually went to China. As said in the linked article from The Telegraph: “It is more likely that the Venetian merchant adventurer picked up second-hand stories of China, Japan and the Mongol Empire from Persian merchants whom he met on the shores of the Black Sea – thousands of miles short of the Orient”. When dealing with data and ramping up data quality a frequent challenge is that some data wasn’t captured by the data consumer – not even by the organization using the data. Some of the data stored in company databases are second-hand data and in some cases the overwhelming part of data is captured outside the organization. As with the book telling about Marco Polo’s (alleged) travels called “Description of the World” this doesn’t mean that you can’t trust anything. But maybe some data are mixed up a bit and maybe some obvious data are missing. I have earlier touched this subject in the post Outside Your Jurisdiction and identified second-hand data as one of the Top 5 Reasons for Downstream Cleansing. 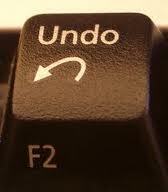 Now, where’s the undo button? I have just read two blog posts about the dangers of deleting data in the good cause of making data quality improvements. In his post Why Merging is Evil Scott Schumacher of IBM Initiate describes the horrors of using survivorship rules for merging two (or more) database rows recognized to reflect the same real world entity. Jim Harris describes the insane practices of getting rid of unwanted data in the post A Confederacy Of Data Defects. On a personal note I have just had a related experience from outside the data management world. We have just relocated from a fairly large house to a modest sized apartment. Due to the downsizing and the good opportunity given by the migration we wasted a lot of stuff in the process. Now we are in the process of buying replacements for these things we shouldn’t have thrown away. As Scott describes in his post about merging, there is an alternate approach to merging being linking – with some computation inefficiency attached. Also in the cases described by Jim we often don’t dare to delete at the root, so instead we keep the original values and makes a new cleansed copy without the supposed unwanted data for the purpose at hand. In my relocation project we could have rented a self-storage unit for all the supposed not so needed stuff as well. It’s a balance. As in all things data quality there isn’t a single right or wrong answer to what to do. And there will always be regrets. Now, where’s the undo button? I guess every data and information quality professional agrees that when fighting bad data upstream prevention is better than downstream cleansing. Nevertheless most work in fighting bad data quality is done as downstream cleansing and not at least the deployment of data quality tools is made downstream were tools outperforms manual work in heavy duty data profiling and data matching as explained in the post Data Quality Tools Revealed. This is an obvious one. At the time you decide to do something about bad data quality the right way by finding the root causes, improving business processes, affect people’s attitude, building a data quality firewall and all that jazz you have to do something about the bad data already in the databases. Data quality is said to be about data being fit for purpose and meeting the business requirements. But new purposes will show up and new requirements have to be met in an ever changing business environment. Therefore you will have to deal with Unpredictable Inaccuracy. Upstream isn’t necessary in your company as data in many cases is entered Outside Your Jurisdiction. When data from two organizations having had different requirements and data governance maturity is to be merged something has to be done. Some of the challenges are explained in the post Merging Customer Master Data. Moving data from an old system to a new system is a good chance to do something about poor data quality and start all over the right way and oftentimes you even can’t migrate some data without improving the data quality. You only have to figure out when to cleanse in data migration. One of the big trends in data quality improvement is going from downstream cleansing to upstream prevention. So let’s talk about Amazon. No, not the online (book)store, but the river. Also as I am a bit tired about that almost any mention of innovative IT is about that eShop. A map showing the Amazon River drainage basin may reveal what may go to be a huge challenge in going upstream and solve the data quality issues at the source: There may be a lot of sources. Okay, the Amazon is the world’s largest river (because it carries more water to the sea than any other river), so this may be a picture of the data streams in a very large organization. But even more modest organizations have many sources of data as more modest rivers also have several sources. 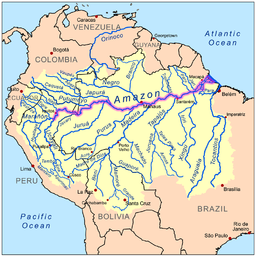 By the way: The Amazon River also shares a source with the Orinoco River through the natural Casiquiare Canal, just as many organizations also shares sources of data. 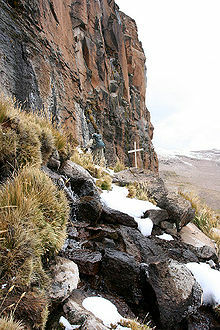 Some sources are not so easy to reach as the most distant source of the Amazon being a glacial stream on a snowcapped 5,597 m (18,363 ft) peak called Nevado Mismi in the Peruvian Andes. Now, as I promised that the trend on this blog should be about positivity and success in data quality improvement I will not dwell at the amount of work in going upstream and prevent dirty data from every source. I say: Go to the clouds. The clouds are the sources of the water in the river. Also I think that cloud services will help a lot in improving data quality in a more easy way as explained in a recent post called Data Quality from the Cloud. Finally, the clouds over the Amazon River sources are made from water evaporated from the Amazon and a lot of other waters as part of the water cycle. In the same way data has a cycle of being derived as information and created in a new form as a result of the actions made from using the information. I think data quality work in the future will embrace the full data cycle: Downstream cleansing, upstream prevention and linking in the cloud.